Double oops! Sorry for the error. Please click here for the January 7th post – “Sew We Go to Hawaii”! Before I admit to a recent mistake, I have to share what happened this past Wednesday. My parents called and asked if they could come over to visit with Sommer and Trey (and Mike and me too, but the great grandkids take priority 🙂 ). Well, Mom brought me not one, but four spool pin doilies she had made since last week’s post! (click here to visit that post). She said the pattern on the site I linked to in the blog worked well. She’s the best! Now for my true confession post! When I was quilting my Silly Goose quilt, I really got into the free motion groove. Then I turned it over to look at the back and, I’m sure you’ve never done this, but… a picture is worth a thousand words. I’d been meaning to move that scrap pile farther from the machine, but I hadn’t, so that scrap mocked me and crawled under the quilt in a densely quilted area, dead center in the quilt back. There was too much spiraling to want to remove it. Since necessity is the mother of invention – it was time to be inventive. Are you ready for my solution? After all, a quilt does need a label 😀 ! And who says it has to be at the bottom? I just had to add a line of geese flying behind the house. Thanks ladies for a wonderful time with your guild! 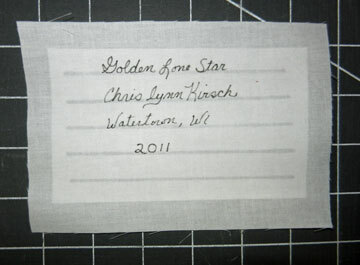 I did a blog post last October with instructions for creating simple labels for vintage quilts. You can click here to read all about it (be sure to read Lucy’s excellent instructions for making labels with the computer). 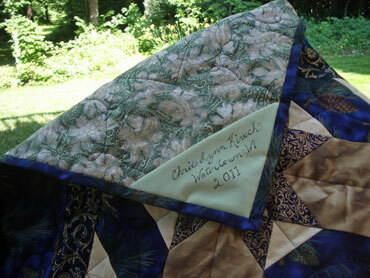 JoLynn’s request made me realize that often we don’t know the quilt’s previous history – so does it really need a label? And if so, what should be on it? My answer would be yes because every quilt has a story we do know: who currently owns it and how they acquired it. JoLynn’s quilt has a wonderful story of adoption and caring and it should be on the label, along with her name, place and date. Taking the time to label vintage quilts, especially if you have a collection, may be the difficult part. I was guilty of this for years and than a dear friend, Maggi Gordon, wrote a book entitled Vintage Quilts. She was interested in including a number of my quilts. Before I could give them to her for photography they needed to be labeled and now I’m so grateful to have them in the book and the labels done! And now for a plea. I’m currently putting together a new lecture called “Tradition with a Twist”. It will include vintage quilts and modern interpretations. I’ve been collecting the older quilts for a while and find there are still 2 patterns I don’t have. I’m looking for an old (30 years or older) Pineapple Log Cabin and a Burgoyne Surrounded. It you have either of these you would be willing to part with, please let me know and we can talk about it :-). Thanks! After enjoying Eileen’s story about her antique quilts last week and having the opportunity to present my antique quilt lecture in Manitowoc, I decided it was a good time to recommend putting labels on our family heirlooms. I’m always encouraging students to label their quilts – and this goes for the vintage ones you own, even if you didn’t make them yourself. I have some wonderful antique quilts. Some are from my family and others I have collected. No matter how I got them, I always appreciate knowing their story. I truly wish some of them could talk, so I’d know the who, when & where. But alas, very few older quilts are labeled. It’s a shame because it can increase their value immensely. So label them! If you have their entire history – great! If not, put down what you do know, even if it’s just that you own it and how you acquired it. 1. Cut a piece of freezer paper the size you desire the label to be and draw parallel lines with a Sharpie™ marker, 1/2″ apart,on the dull (paper) side. 2.Iron the shiny side of the freezer paper onto a piece of muslin (this view is of the lines showing through to the muslin side). 3. 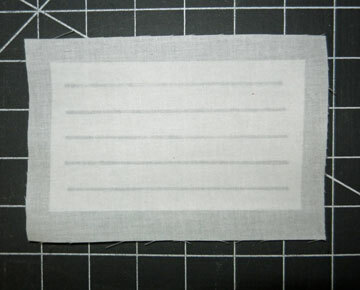 Write the label information on the muslin with a fine line fabric marker (I prefer the Micron Pigma™ marker, size 01), using the freezer paper lines as guides to keep your writing straight. 4. Remove the freezer paper, turn under the edges and appliqué the label to the back of the quilt. Creating labels on a computer and printing them onto colorfast printer fabric is another good option. What information should you include? Who made it. When. Where. For whom. Who owns it. When. Where. Anything else you’d like someone to know when you’re no longer around to tell them. Remember to label your current quilts too. They may not be around 100 years from now, but if they are, someone may want to know about you :-)! This past week I came up with a really simple way to label a quilt and I can’t wait to share! It’s a variation of a quilt hanging technique I’ve used for years that works great on small quilts. To simply hang a small quilt: fold 2 squares of fabric in half diagonally and place them in the top corners of the quilt before binding. When the binding is attached, a dowel, cut the width of the quilt, fits inside the corners for easy hanging without a sleeve. 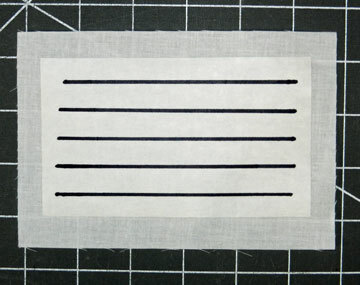 Turn to the fabric side and write all your information on the bottom half using a fine, permanent fabric marker. Remove the paper, fold the label wrong sides together and pin into a bottom corner of the quilt before binding. Once you bind the quilt, 2 sides of the triangle will be secured and the folded edge can be left open or handstitched down. I’ve found a new labeling trick I really like! Hope you like it too!